Setting sail from Vlychada Marina and cruising along the coastline, we arrive at Akrotiri’s Red Beach, admired for its distinct red hue, caused by the rich in volcanic minerals soil. Next we sail towards the White Beach. Then we sail towards Mesa Pigadia for a swim break. Snorkeling gear and towels are provided to all our guests. Later, we pass the Lighthouse and enter the Caldera for a unique view of the whole bay. Our sailing route includes a close sail by the volcano crater and a full view of it.Our next stop is at the Hot Springs. This is where our second swim break takes place in the sulfurous waters that provide a natural spa. 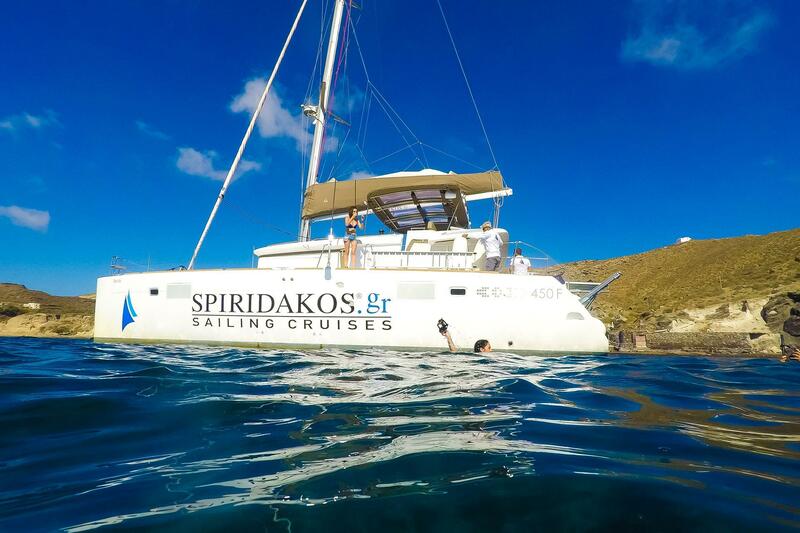 With the breathtaking views of Thirassia Island as a backdrop matching the picturesque Village of Oia, your Santorini Sailing experience shall culminate in the most unique and unforgettable way possible.